Former Ryder Cup captain Bernard Gallacher is to lead a field of nearly 300 golfers teeing up for the Tomatin Homecoming Single Malt Pro-Am over three of Scotland’s most renowned links courses later this year. Gallacher played in eight Ryder Cups and was captain three times, including a victory at Oak Hill in 1995. He has confirmed he will captain one of the 70-plus teams taking part in the 54-hole event, played at Castle Stuart Golf Links, Royal Dornoch Golf Club and The Nairn Golf Club from 30 September to 2 October, just a few days after this year’s Ryder Cup. Money raised during the tournament will support a nationwide campaign Gallacher launched in December to make automated external defibrillators (AEDs) widely available at golf clubs and driving ranges in the UK and Ireland. In August last year Gallacher, suffered a cardiac arrest and spent several days in Aberdeen Royal Infirmary after falling ill at a function in the city. He credits the quick thinking of hotel staff and the availability of a defibrillator at the venue where he was due to speak for helping his recovery. 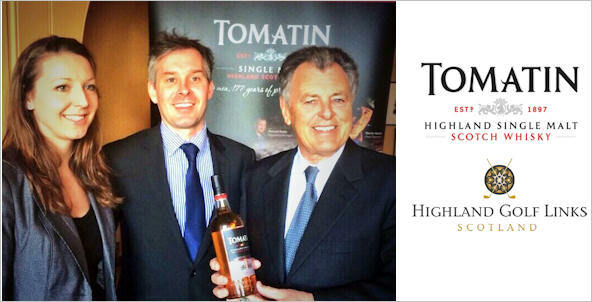 The prestigious annual Tomatin Pro-Am contest is estimated to generate about £200,000 for the Highland economy. It is open to teams from anywhere in the world consisting of three amateurs (ladies or gentlemen) plus a professional of their choice. Teams that do not include a pro are allocated a leading player from the Professional Golfers’ Association Scotland Order of Merit. Stephen Bremner, Tomatin’s sales director, said: “We are delighted that Bernard Gallacher is leading a team in the Pro-Am this year as his worldwide reputation will add to the prestige of this competition. “The tournament is already popular with professional and amateur golfers alike as it is played over three of Scotland’s best links courses, and Bernard’s involvement raises the event’s status to another level. “The UK is a key market focus for us this year. In the last five years we have experienced 40 per cent growth in volume and 158 per cent in value, and for this reason sponsorship of a prestigious UK event such as this is an excellent fit for us. Castle Stuart Golf Links hosted the Scottish Open for three successive years from 2011, with the 2013 competition, won by Phil Mickelson, reaching a television audience of more than 500 million. It is consistently placed among the top 100 courses in the world by a number of prestigious golf publications, most notably Links Magazine and Golf Course Architecture. This year Royal Dornoch’s Championship Course was ranked the 6th best in the world by Golf Digest, its highest ever position, and is a favourite of Major winners such as Tom Watson, Ben Crenshaw, Craig Stadler and Greg Norman. The Nairn Golf Club, rated 9th best golf course in Scotland by Golf Monthly in 2013, hosted the Walker Cup in 1999 and the Curtis Cup in 2012. It will also be home to the Home Internationals competition in August 2016. The three clubs are part of the Highland Golf Links (HGL) partnership which also includes the Kingsmills Hotel and Culloden House Hotel, Inverness; the Royal Golf Hotel and Links House, at Royal Dornoch; and the Golf View Hotel in Nairn to promote destination breaks. Castle Stuart placed a new defibrillator for the club shop earlier this month, while Nairn put a similar machine in the clubhouse last year. Royal Dornoch Golf Club has had a defibrillator for two years and is currently raising money for the Bernard Gallacher campaign to have another machine at the Championship Course’s Halfway House. The club was given a driver used and signed by Bernard’s nephew, the Scottish professional golfer Stephen Gallacher to help raise funds. Fraser Cromarty, CEO at The Nairn Golf Club and chairman of HGL, said: “The Tomatin Pro-Am is a significant part of the golfing calendar in the north of Scotland and showcases three of the best links courses in the country.